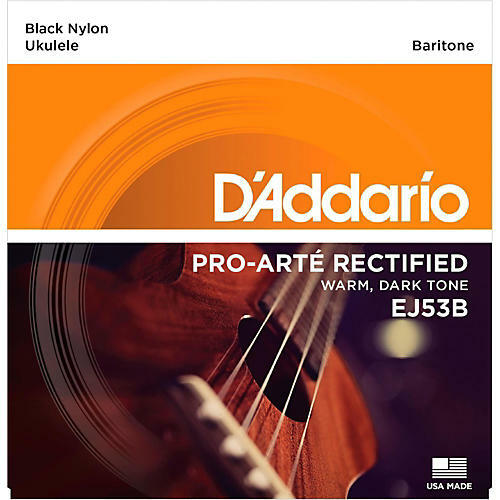 D'Addario EJ53B Pro-Arte Custom Extruded Baritone Nylon Ukulele strings are designed specifically for baritone ukuleles. The 3rd and 4th string are a silver-plated copper wound on nylon complimented by a 1st and 2nd string, which are made from D'Addario's black precision rectified nylon. This set is optimized for usage with standard DGBE tuning. The original ukulele offering from D'Addario, each black nylon string is carefully center-less ground to an ultra-smooth, ultra-precise final diameter for excellent feel and unparalleled intonation with a warm, long-lasting acoustic tone.